Squeeze that special someone with a bit of Bold and Bright Hugs to kick off the season right. 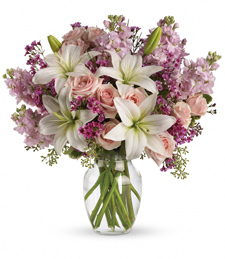 Deep magenta and lavish lavender fresh blossoms speak more than words can say. That luscious gift is sure to turn heads with a bit of warm fuzzy affection! Make them blush in sweet shades of perfect pink, deep magenta, and snow white to add that tinsy bit of color to that special occasion. A feminine dainty little gesture is always the right choice. Enjoy the moment and let your hair down for the time of your life! 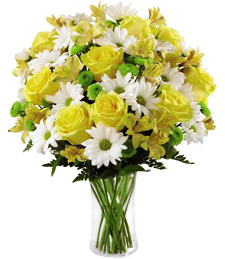 Full of beautifully colored flowers arranged with artistic flair, this bouquet truly speaks to the soul. Make a stylish statement with eye-misting loveliness�order today! 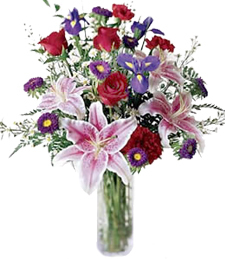 Lilies, stargazers and roses abound from this arrangement, boasting pink, white, cream, blue and purple blooms. 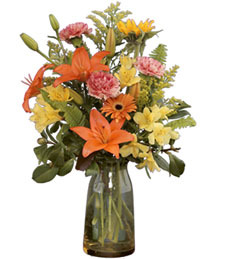 It's an eye-catching and vibrant addition to any occasion. 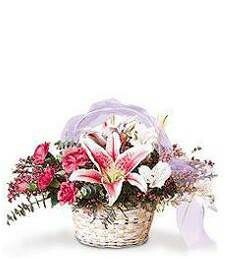 Flatter a particularly precious person with pink and white flowers overflowing from a charming basket and accented with lace. 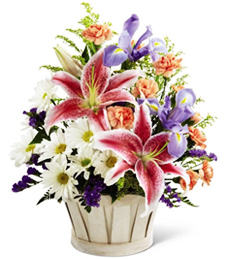 Add a bit of pretty wonder to their world�order a delivery from a talented florist today! 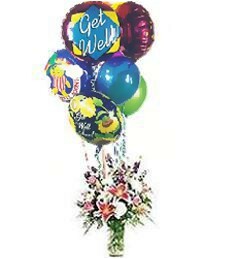 Put pep back into a weary friend or loved one's step with this arrangement of beautiful, vibrant flowers and festive, bright balloons. 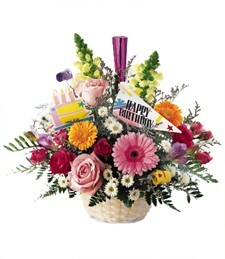 A kaleidoscope of color and fragrance, this assortment will say Get Well Soon in memorable style! Celebrate that special occasion with a shimmering highlight of precious pastel bue and snow white florals in your favorite design. Release that artistic side with an inspiration of beauty and utter creativity. 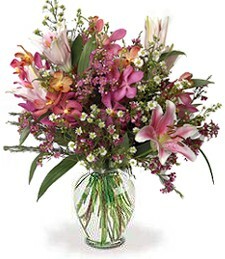 Embrace the moment with fresh florals for time is of an essence! 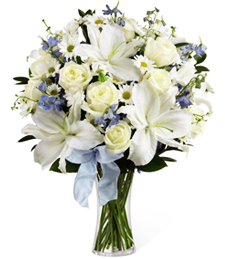 Add a bit of elegance and striking beauty to that memorable occasion. At some point in life we are all touched by love. 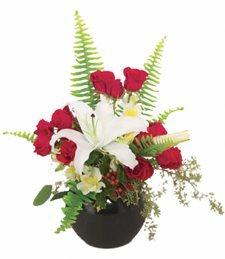 Give that special someone a piece of your heart with a plethora of ravishing red and shimmering white blossoms to set their spirits free. 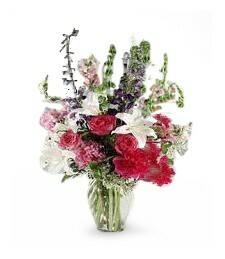 Wild Flowers of Love make a bold and beautiful statement for any occasion! 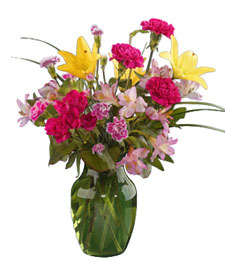 Grab an array of pink, red, yellow, and peach blossoms to set the occasion right. 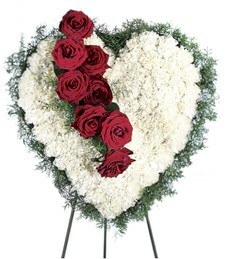 Think of that special someone as a life long friend and they will be there forever! 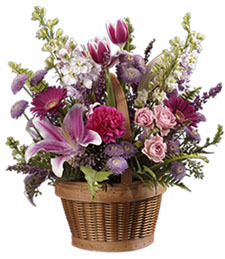 Brimming with vibrant, fresh flowers, this stunning assortment is a true ode to nature's beauty and grace! 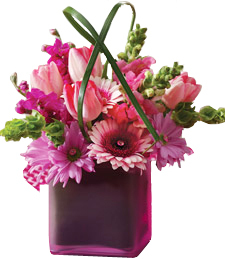 Sure to illuminate any room, these vivid blooms make a lovingly luminous and sweet smelling gift! 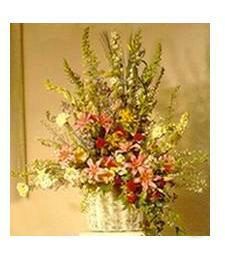 Overflowing with stunning, fresh flowers, this lovely vase exudes rustic elegance and natural beauty! 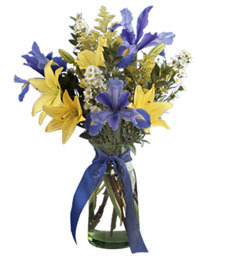 Sure to brighten any room, these breathtaking blooms make a truly luminous and sweet smelling gift! 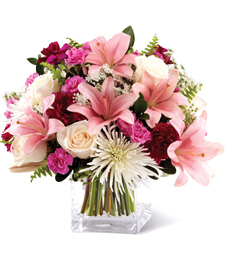 Brimming with sensational shades of red, pink, yellow and white, this exquisite array of fresh flowers exudes nature's breathtaking beauty and grace! 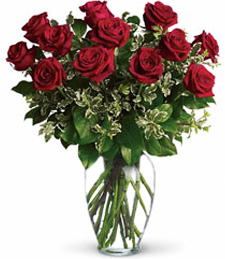 Sure to illuminate any room, these breathtaking blooms make a sweet smelling and special gift! 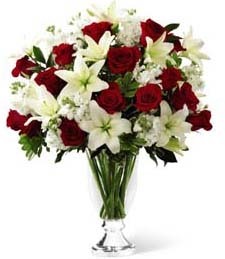 Share the fresh sweetness of red and white flowers! 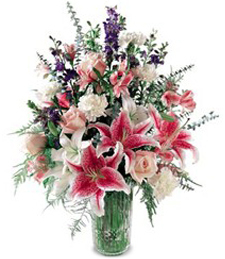 Beautifully arranged tall and full by a talented florist, this lovely bouquet adds a splendid touch to any room. A fabulous gift!